Because of significant impairment of the tightness compressor will not be able to create a predetermined temperature in the refrigerator compartment without energy cost. Timely replacement the seal on the refrigerator will help to preserve the shelf life of products, reduce the amount of the bill for electricity and prevent the occurrence of other technical problems. Check the wholeness of the elements throughout the contour. There should be no breaks, cracks or other visible defects on the seal. A strong impairment of the original form can also break the tightness. If the seal has lost flexibility over time, it will not be able to fit snugly the walls of the body. Cracks could be formed because of the presence of dirt on the surfaces connecting when the door is closing. You must also check the hinges, its mount and geometric parameters of this node. The easiest way is to place a sheet of paper over the seal. If it is freely removed in the closed position of the door, you should make a more thorough diagnosis. Continuous or prolonged operation of the compressor, the temperature rise inside the refrigerator compartments are the evidence of problems. If you intend to replace the rubber seal of the refrigerator, it is recommended to buy only the products of the refrigerator brand. Low-quality products may differ slightly from the original in size and other parameters. However, it will be enough to break of airtightness. The preparatory work is done first. It is necessary to dismantle the door to replace the seal in the refrigerator without any difficulty. It is installed on a horizontal surface with a soft lining. The new seal has to be withstand at least a day where the equipment is installed, in conditions of appropriate humidity and temperature. Rubber will become softer if you lower it in heated water. But this technology is suitable only in cases when the design of the product does not contain technological holes. Then dismantle the old element. Universal technology does not exist, because in practice different types of fasteners are used: glue, deepening of a special shape, screws, combined methods. 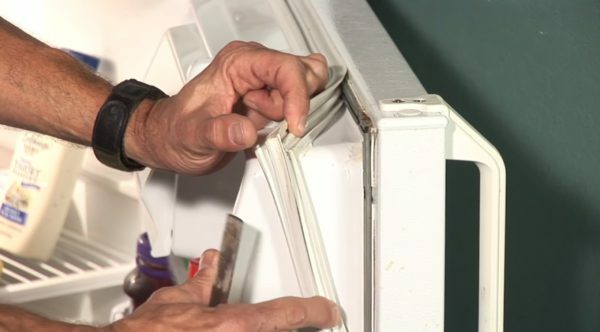 Replacing the sealing rubber of the refrigerator will be done correctly if you carefully clean the fixing area. As a rule, the white spirit is used to remove glue residues, without damage the paint. To avoid errors, read the specifications and instructions before replacing the seal.